This Halloween, you are really craving a unique look that is the perfect blend of a bit retro and a bit cuddly. You’d like to look loved and classic. Well, well, well, aren’t you Captain Specificity this year! It’s OK, we’re used to clients with unusually high standards and difficult desires. So, here is what we’ve picked out for you. We just know you’re going to say yes to this dress. Oh wait, that’s a different thing. We just know you’re going to swoon for this costume. There, that’s better! In this Adult Sock Monkey Costume, you can look just like the fun, vintage toy your grandmother might have made for you. 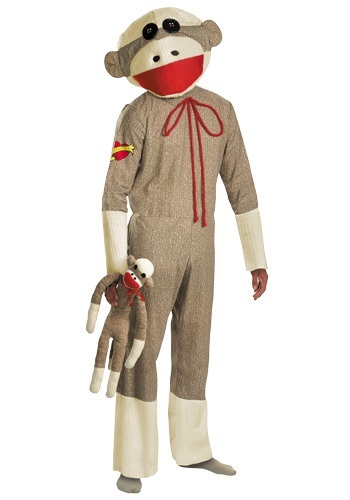 Sock monkeys are so iconic that everyone will adore you on sight, and you will be tasked with giving comforting hugs to nostalgic pals wishing to relive their childhoods. We just knew you’d love it! The cream jumpsuit even has a heart tattoo that says “Bananas” (awww) and the long stuffed tail will prove perfect for wrapping around you as you nap on the couch in between cuddle sessions. You may be so loved in this costume, that you may want to wear it on a random Tuesday to spread cheer around your neighborhood. We can’t wait to see what impossible costume standards you set out for us next year. And we REALLY can’t wait to break through all of them with yet another perfect ensemble.